In 1995 we discovered another 1.5 km of active streamway after the 'Lac Terminal'. 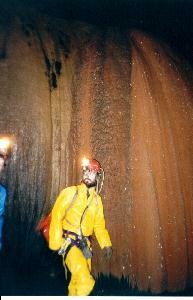 In September '96, 1544m were surveyed, making Ain El Libne number 4 on The Longest Lebanese Cave List. We ended in a chamber with a 15m cascade which we were unable to climb, due to lack of equipment, but the cave still goes! 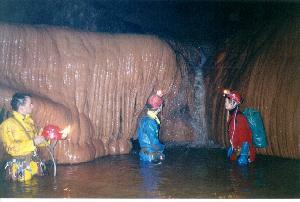 In 1962 the Ain el Libne cave was first explored by Lebanese cavers, followed by British in 1965. In the early seventies the first hundred meters of the 'nouveau réseau' were discovered by Jacques Cousin (B) and a Lebanese. They made a description, but the access was never found again. 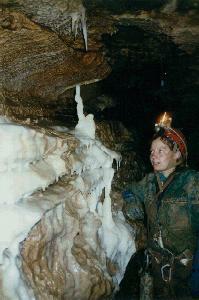 In 1987 the cave was surveyed (GERSL). In 1993, 900m of fossile passage was discovered on top of the 'Lac Terminal' by ALES. From 1995 Spekul was active in Ain El Libne. On different trips in '95 by Spekul and ALES several new parts were found. This is the report of the 'nouveau réseau', the meander behind 'Lac Terminal'. The voute mouillante and the meander behind it was explored for over 1 km by Spekul (Lieven De Bontridder en Bart Simons) in September 95 till Terminus 95. Fadi Beayno (ALES) reached Terminus '96 in august 1996. In September the active part as well as the fossile parts in the beginning were surveyed by Spekul. There are still lots of accesses to fossile parts, which are marked '?'. From Lac Terminal a voute mouillante starts (130m long, wetsuit required). Most of it can be crawled on hands and knees, there's just one part where the helmet has to be removed. Crawls are succeeded by walking passages. Halfway one has to climb up to a small chamber, to reach the water again after a few meters, followed by the lowest part of the voute. After another crawl one comes in a high joint with rounded pebbles (Perles) on the floor; the flow must be constant to prevent them from being washed away, so don't fear flooding. The whole voute lies in the same joint. The streamway meanders at the end and gives into Le Vestiaire, a chamber where the water flows underneath blocks. Here one can remove the wetsuit, the rest of the cave can be done without it. About 50m after this chamber, one can climb up 5m to the Fossile Galleries. Here, you find yourself in a high canyon, abandoned by the water, 20m high, 60cm wide, which is beautifully decorated, especially on the eastern side; the roughness of this wall is filled up with thousands of 10 to 20 cm stalactites. This canyon suddenly ends on the Southern side. To the North one reaches an unstable 'elevator-shaft' which brings you to a second and third level. The top floor (marked -.-.-.-. 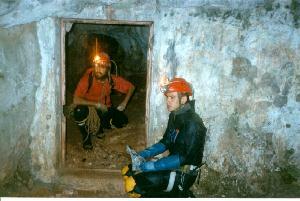 on survey) is a tunnel-like passage, 1m in diameter which gives into a chambers here and there. There are lots of squeezes and boulder chokes, but the way on keeps on going. A deep pitch (P19, which gives into the second level) is crossed (somewhat tricky). After a beautiful pressure tube, the passage becomes very low, but still continues. This was not explored as we decided to survey the second level, which is more beautiful. Take the elevator down to the second level. This is probably the continuation of the canyon which was described in the beginning. The formations here are even more abundant and there are some active flowstone formations. Here, the white calcite has egalised the floor (Patinoire de calcite= Calcite ice skating field). The canyon suddenly ends and the passage turns left to give into the active part again. The streamway goes on another 100m in the same direction. Here, the ceiling comes down and one crawls through the water underneath blocks (narrow and wet), or you climb over the choke, where a vertical squeeze gives again to the water. This area is probably perturbed by an important fault. After this annoying passage, the orientation and morphology of the cave change; the way on meanders more and becomes wider, to give into a chamber where one can go right to reach the second fossile level, described above (this way, the annoying passage can be avoided). Further on, climbing down 2m blocks leads to a shallow basin, where one has to climb up the 6m Cascade. It gets quite narrow on top and there might be an access to fossile galleries here. The morphology resembles the passage after Le Vestiaire; a high ceiling, 1 to 1.5m wide and meandering. This goes on 200m where a nice passage (between Le Tobbogan en Bassin) consists out of small basins and cascades, which make it hard to stay dry. White calcite is copious. The way on gets wider 200m away, where it starts 'raining' (La Pluie) from an inlet high in the ceiling (not explored). After 60m the river then disappears in a low part; on the left one can follow the fossile bed over 50m, a narrow and nasty meander. One can also follow the water, especially if you're still wearing a wetsuit. The water joins the meander again, 50cm wide and a very high ceiling, and this for some 150m. Here you find plant-like exentriques, half a meter above the water level. Climb a series of small cascades to reach Terminus '95 where Bart and Lieven decided to go back last year. It is a squeeze at 2m above the bottom. Behind this, there's another 150m of meander which finally gives into a beautiful circular chamber, 10m long, 6m wide with steep walls (Terminus '96) where a cascade of 15m comes down from a crack. This crack is too narrow at the base, but 5m higher up, it widens and it might be penetrable. We tried to climb up with the mast, but the walls were to rotten to continue the ascend. 'Geo-logically' the cave might develop another 600m in bird's eye view, up to where the layers are very steep, which made us think that there might be a connection with the surface (infiltration area). Some extra 1544m were surveyed, moving Ain el Libne to the 4th place on Lebanon's longest caves list and there's still lots of fossile parts to be explored. Behind the terminal chamber '96 there might be another 1000m of meander. 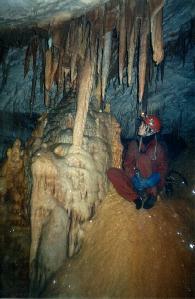 Ain el Libne is a nice, beautiful cave, which mainly develops horizontally. It's not hard to do, just a little tricky here and there. There's still a lot of potential for further exploration. We'll be back. 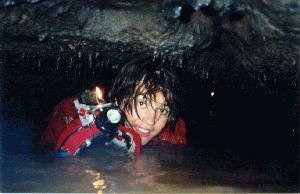 On Friday evening, September 6 1996, we (Vincent Coessens, Lieven Debontridder and Steve Smeyers) entered the Mar Challita cave. On top of the pit to the river, 2 new spits were fixed. The water-level was not significantly lower as usual, great care was taken in getting the Hilti drill through the voute mouillante. We reached the squeeze which was described in Speleorient (p43) by Abdul-Nour as follows: '... deux séances de désobstruction au marteau + burin, sans grands résultats. La suite du réseau appartiendra à ceux qui utiliseront des méthodes plus radicales.' Two large parts on the left side of the squeeze were blasted away, using two cartridges. Attempts to do the same on the right side failed, probably because the rock was soaked wet there. However, the obstacle could be passed, but it would be very sporting. We went out without trying, as Steve was shivering from cold, without the upper part of his wetsuit. On Sunday morning, September 8, we're back at Mar Challita and we were very supprised to see other cavers (GERSL) at the entrance, equipped to... enlarge the squeeze! They were not unpleased by the news that their work had been done by us, two days earlier. Lieven is the first one which passes the squeeze, after taking off all his gear, followed by Imad, Vincent and Steve. Behind this sporting obstacle, one arrives in a deep and large basin (4.5 x 6)m², followed by a narrow and deep canyon like the one before the squeeze and in the same orientation. A little climb then leads to a widening gallery, with basins here and there. Further on, one can see more concretions and the first coulees with higher levels above (not explored). From here, one has to walk about 40m through shallow water to reach a giant red coulee with shining calcite crystals on it. Here Steve took out his wetsuit (one can stay out of the water in most parts of the cave) and Imad went back to his comrades behind the squeeze. The coulee can be passed on the left side through a narrow passage, or through a basin on the right side. We are now walking through a gallery of large dimensions where halfway, a remarkable black stalagmite can be found on the right side, just above the water-level. Further on, giant red coulees are encountered on the right side, which are full of gours on top. From here, on can follow the river, or climb the coulee to get in a higher level, which joins the river again. In the southern end of this higher part, a little river emerges in the cave, out of a very small opening. In the roof, there's a hole which might lead to a superior level. Both this hole and the little flow of water probably formed these great concretions. After this, the river follows its way through a large gallery, where on the left side a collapse can be seen. Thirty meters further one arrives at the most beautiful and spectacular part of the cave, the 'Cascade Rouge'. This is a waterfall of 3m high, falling down in the middle of coulees on the left and right side. On top of it, there are two ways on; on the right side, there is a gallery from where the water comes. The stream of water is split in a part that runs off the cascade, and another part that flows in the gallery on the left. This left gallery again splits a few meters further in a right part, from which another stream is coming, and a left part, in which the water disappears. This passage soon becomes too low to follow, but one can see that at the end, the water turns 90º to the left (West). Where this water goes to, is not clear. The right part (of the gallery on the left) can be followed about 40m through a 'conduit forcée' till a small sump is reached, out of which the water emerges. On the right side, behind the Cascade Rouge, one can follow upstream a lowering gallery till a remarkable turn to the right, with beautiful concretions. The cave continues through a low (2m wide, 40cm high) passage for about 20m. In the middle there's a higher part, in which one can sit upright. This passage brings you into a large chamber with mud on the right side and a beautiful 'miroir de faille (295º)'. A little further the river emerges out of a basin which is a sump of about 1.5m deep. There might be a continuation in a hole, about 5m higher up, or in a meander on the right side, just before the sump. On Tuesday, September 17, Jimmy Adams, Katie D'haene, Lieven Debontridder and Vincent Coessens go back with the mast, to climb the aven before the sump. On top, Lieven finds a small hole, filled with mud up to the ceiling, which gets impenetrable. The mast was then put inside the sump and followed by Vincent in freedive with a camera. The sump is very clear, and after about 5m (3m deep) it narrows to a height of 50 to 60 cm. Because lack of appropriate diving equipment exploration was halted. However, the pictures taken, show that there might be air above the sump on the other side... On our way back another hole in the ceiling, just before the water-separation was checked, which also turned out to be choked with mud. Halfway the cave, close to the cascade just behind the deep basin below the red flowstone, we find a small meander, close to the ceiling with stagnating water. It's quite narrow (30 cm) and very beautiful on the bottom (shining calcite crystals on the bottom, like in Jeita's Salle Rouge). This is a well known resurgence which was impenetrable. In spring, water emerges out of a boulder choke (eboulis), some 4m above the road. The level of the resurgence lowers during the year, with a minimum around half September. This and the constant (icy) temperature of 5°C made us think that there might be an important reserve behind it. Since 1996 had been a dry year, this was an unique chance to explore this resurgence. Tuesday evening, September 10: Maybe the water, that emerges next to the road in this season, could be reached through a boulder choke, about 4m higher up. Vincent Coessens, Lieven Debontridder and Steve Smeyers perform a little desobstruction. It soon becomes clear that it needs blasting. On Thursday, September 19, Lieven and Vincent go back to survey the cave and to look for a continuation at the end, where one can hardly breathe in the triangular crack, just above water-level (remove glasses!). Behind this, there's a small airbell, after which it seems to be finished. In most parts of the cave, one can just stand upright, with the water coming up to the shoulders and the helmet touching the ceiling. Other parts are more tricky, with only a few cm of air above the water. On our way back, while surveying, Vincent discovers another, nearly submerged passage on the western side. After about 3m, there's a small space in which one can keep the head upright. Behind this, the water becomes more shallow and one has to crawl over a boulder lying in the low passage. One arrives in a relatively large, dry chamber, with dried-up mud on the southern side. This part was not surveyed because of the cold, we were not capable anymore to light our piezo with our cold fingers. There might be continuations in this room and also at the end of the cave after a (small?) duck.